The luminaire shall be a 2000 watt follow spotlight designed to be used with various manufacturer's 2kw xenon lamps. The optical train shall consist of a highprecision, electro-formed, coated reflector, heavy duty nichrome iris, chopping shutter, gobo holder, fader, effect slot and a single lever variable focal length zoom objective lens system. A rapid focus knob located on both sides of the spotlight shall focus within 4 revolutions. All lenses shall be clear optical grade lenses. The color boomerang shall be mid-mounted and reversible and use industry standard 9" frames. Top mounted controls for the iris, fader, and shutter along with dual control for zoom and a reversible color boom shall make the spotlight readily convertible from right to left operation. Power for the spotlight shall be a bottom mounted self-contained power tray and shall be readily removable for servicing. Cooling shall be provided by three quiet blowers. A slide control shall be provided to adjust the tilt balance to suit individual operators. The spotlight body shall be constructed of cold rolled sheet steel and aluminum extrusions and shall be finished in light grey and black wrinkle powder coated baked finish. A three legged folding base shall be provided. Head dimensions shall not exceed 73"L x 22.5"H x 19.5"W (including controls) with a head weight of 187 lbs. The spotlight shall be internally switchable to operate on either 100-120 or 208-240 VAC 50 or 60 Hz. The spotlight is of the xenon type which must be operated and maintained by individuals trained in the operation, maintenance, and hazards of xenon lamps. 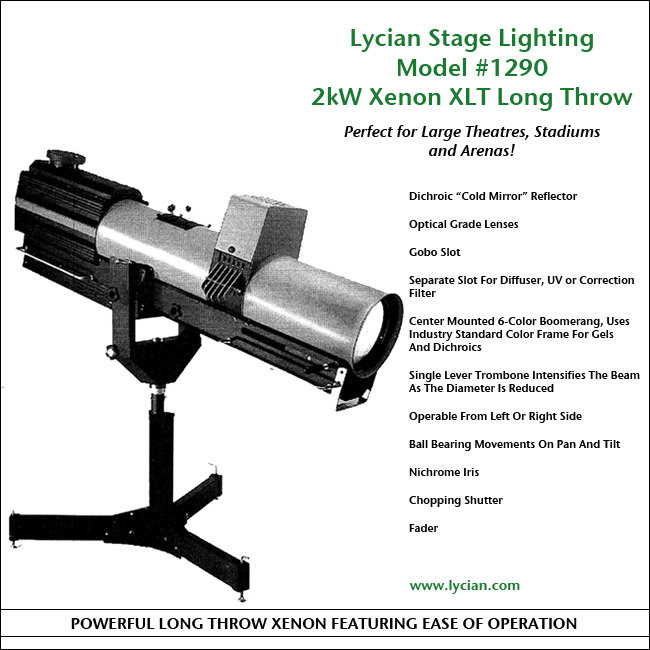 The spotlight shall be the Lycian Stage Lighting Model 1290 XLT.